Sally Ride was an American icon, written about often for her achievement as the first U.S. woman to reach space. She died Monday (July 23) at the age of 61. 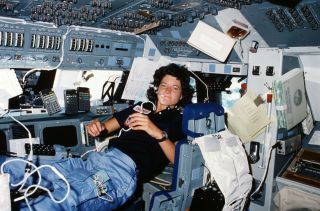 Ride became the first American woman in space when she launched into orbit on the space shuttle Challenger on June 18, 1983, during NASA's STS-7 mission. She flew a second space mission in 1984, and trained for a third spaceflight that was later canceled after the Challenger shuttle disaster in January 1986. After leaving NASA in 1989, Sally Ride eventually founded her own company, Sally Ride Science, to inspire young women to pursue careers in science, math and technology fields. The fact that I was going to be the first American woman to go into space carried huge expectations along with it. I didn't really think about it that much at the time …but I came to appreciate what an honor it was to be selected to be the first to get a chance to go into space. It means a lot to me that my participation in that flight has meant so much to so many people. And I hadn't appreciated how much it did really mean to people, how much it touched particularly women, until after my flight. The first few months after my flight I was really struck by the way that women of all ages —from college students to 60-year-old, 70-year-old, 80-year-old women — reacted to me. It was just something that they never thought they would see. And it made quite an impression on me. It was probably very important to my future. I didn't have a lot of confidence in myself. I did well in math in high school, but I didn't know if I would be able to do well at math in college. At Westlake, it was all girls in the trigonometry, calculus and chemistry classes. That environment gave me the confidence and motivation to declare a physics major in college. It's not cool to be a scientist or engineer. These kids want to do things that are cool – like be a pro basketball player, an actor, a singer, a playwright. Things that our culture puts in front of them in papers and on TV all the time. When they're relatively young, they think science is cool and interesting, but they lose that in socializing. That was the motivation for Sally Ride Science. Weightlessness is fun. It doesn't feel any different to your body or to your insides. So you feel the same. But the difference is that you can float in the middle of the room — you can do somersaults in the middle of the room, and in fact, you can't stand on the floor. You will float off the floor. I think there probably is life, maybe primitive life, in outer space. There might be very primitive life in our solar system — single-cell animals, that sort of thing. We may know the answer to that in five or ten years. There is very likely to be life in other solar systems, in planets around other stars. But we won't know about that for a long time. I was aware of all the hoopla in the media. But I was much less aware than you might expect just because you know how those days and weeks before launch are. There is so much new information to cram in. People are coming at you every day with this little piece of information they forgot to tell you. And this procedure has changed just a little bit. And have you practiced this recently. Just a barrage was enough to keep me from being able to do things like watch the news or pay much attention to the newspapers, and frankly, the fact that I was in training and within NASA's kind of bubble made it easier for me to focus on the flight and it made it relatively easy for me to ignore what was going on at least pre-launch. I got a call early in the morning. It was well before eight in the morning in the office at JSC. I want to say it was around 7 or 7:30 in the morning because I tended to get into the office early. A lot of the astronauts get into the office early. I think we had a crew meeting every Monday morning at eight or 8:30. So I was in early and I got a call to go over to Mr. Abbey's office. (George Abbey, the legendary and mysterious director of flight crew operations at the time). And you know, that was generally taken as either a very good or a very bad sign. And there had been a lot of rumors swirling about the fact that they were about to name another crew or two. And so I went over, walked over to Building One and went to the eighth floor to Mr. Abbey's office and I was the only one in the meeting. His assistant had me go right in, and it was me and George Abbey, and he said something like, you know, in typical George Abbey fashion, 'So do you still want to fly?' And I said, 'Um, Yes I certainly do.' And he said, well, um, then we're going to assign you to STS-7. And at that point, Crip (veteran astronaut Robert Crippen) was the only other person who had been assigned to the crew and knew what the crew complement was going to be. So George told me, talked to me for a few minutes, and then took me up to the ninth floor to meet with (Johnson Space Center Director) Chris Craft. And it was just three of us. And Chris Kraft, you know, talked to me just a little bit. It was kind of like, 'Are you sure you want to do this? We're thrilled to have to on the crew, but we just want to make sure that you know what you're getting in to.' And at that point, of course, all I cared about was getting a chance to fly. So I said 'Yes-Yes-Yes.' And then I went back down with George to his office and he called the rest of the crew over. You know, put in the calls and told John Fabian to come on over and Rick Hauck to come on over and at that stage we were going to be a crew of four. So Crip came over and the rest of the crew was told, and we were told also that we couldn't say anything to anybody upon pain of being ex-communicated from the crew until the press release was put out later that morning. And so John Fabian and I went over to the cafeteria — you know, by now it's like 9:30 in the morning, 10 in the morning. The only people in the cafeteria and we ordered a piece of peach pie, I think. We knew we couldn't go see anybody else because we would have let the cat out of the bag.